Getting to Nozawa Onsen is relatively simple from Tokyo or Narita Airport and usually takes around 3-4 hours depending on the transportation used. For directions from Tokyo see here, or from Nagoya/Osaka/Kyoto see here. Hint: Don’t rely on static timetables posted on other websites as these can change regularly. 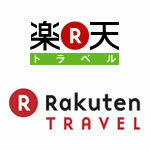 Use this very useful link to find the most up to date Tokyo to Nozawa Onsen time tables. For more detailed information on getting from Tokyo to Nozawa Onsen from Nagano see below. 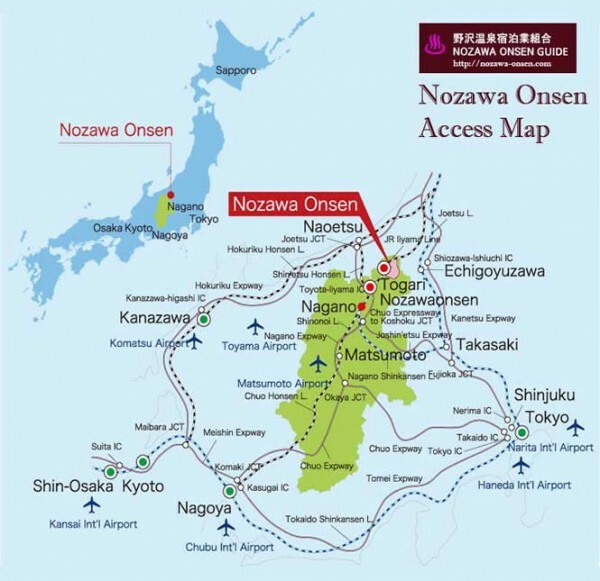 A Nozawa Onsen access map can be seen below or downloaded here. There are also various direct shuttles run by various companies but schedules and bookings (and sometimes reliability) can be fluid. Nagano Snow Shuttle has five shuttles per day from Narita/Tokyo airport, one shuttle from Haneda Tokyo Airport, plus one shuttle each from Myoko and Hakuba resorts. 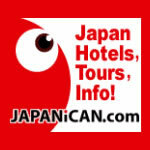 Find Nozawa Onsen Accommodation with some of our valued partners – instant confirmation! Catching the train to Nozawa Onsen is the usually the favoured option. Take the Hokuriku Shinkansen from Tokyo (or Ueno) and get off at Iiyama Station. Getting from Iiyama Station to Nozawa by bus is quite straightforward. Upon arrival at Iiyama take the escalator downstairs to the concourse and look for the Nozawa Onsen Liner bus. Check the Nozawa Liner schedules here. The journey takes about 20 minutes. If you arrive late call the local Nozawa Onsen taxi service or pre-arrange a pick up with your hotel. The total cost from Tokyo to Nozawa Onsen via train is around 10,000 yen and will take approximately 3-4 hours. 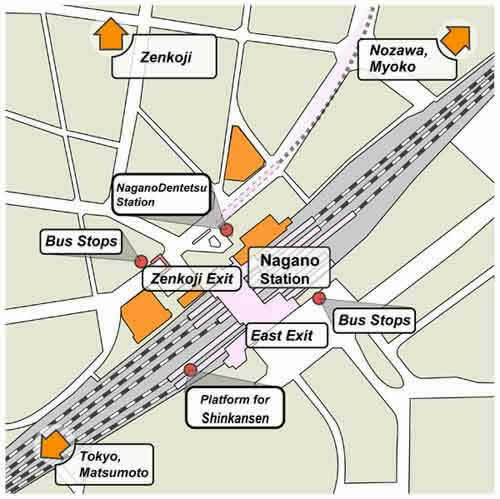 For getting to Nozawa by bus from Nagano Station exit Nagano station via the East exit (see Nagano Station plan below), then take a Nagaden bus bound for Nozawa Onsen. 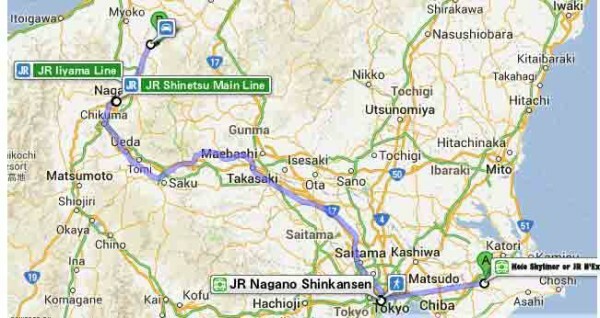 There is a direct bus from Shinjuku (Tokyo) to Nagano which takes around 6 hours with a cost of 4,800 yen. There are buses from Osaka, Kyoto and Nagoya to Nagano – see here for more details. There are taxis that provide a direct service to or from both Tokyo airports (Narita or Haneda) to your lodgings in Nozawa Onsen. The fare per adult is approximately 14,500 yen from Narita, 13,500 yen from Haneda or 15,000 yen from Chubu International Airport (Centrair) in Nagoya. This is only marginally more than train fares and saves the hassle of changing trains, carrying bags and/or herding grumpy kids. Children’s rates are usually 50% (under 12). Bookings can be made online in English. There may be a small surcharge for ski bags or large luggage. There is a winter shuttle available to the nearby ski resort Madarao Kogen. For more details see the Nozawa Onsen – Madarao Kogen shuttle website. There is an onward available bus to Myoko Kogen from Madarao. Many skiers combine a trip to Nozawa Onsen with a few days either in Hakuba or Myoko Kogen. Visits to Togakushi Village, Zenkoji Temple or the Snow Monkeys are also very popular. Renting a car to travel to Nozawa Onsen is a popular option. For ease of pre-booking a rental car online and great selection RentalCars.com are a great choice. This company provides an English website and support in English, plus some cars can come with English GPS. The closest car rental location to Nozawa Onsen is in nearby Iiyama City near the train station. 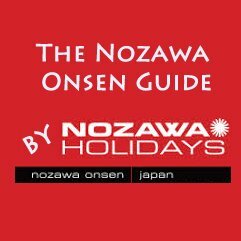 Check out this useful outline for getting from Tokyo to Nozawa Onsen (including timetables, prices and timeframes) – thanks to Nozawa Holidays.